If you install the Acrolinx Server on a test system, you can use the Dashboard to analyze the results of a performance test. Check a range of documents that are typical of what your writers would check on a daily basis. Estimate how often your writing team will probably check their documents and run a batch of checks that reflect this checking volume. There are two useful performance measurements on the language server pages of the Dashboard. If either of these measurements are unacceptable, you should upgrade your system to support one or more additional language servers. A "token" is a term that comes from computational linguistics, but most of the time, a token equates to a word. Words make up approximately 80-85% of the tokens so if Acrolinx checks 250 tokens in one second, that measurement would correspond to about 200-215 words per second. 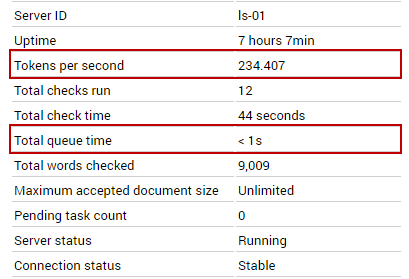 Once you know the number of words processed per second, you can estimate the number of pages which the server can check per hour and compare this number to your estimated checking volume. If a user starts a check while all language servers are still processing checks from other users, the core server places the check in a queue. When a language server has completed a check, the core server takes the first check in the queue and sends it to the available language server. The total queue time is a running total of the amount of time each check spends in the queue. You can divide the total queue time by the total number of checks to get an idea of the average amount of time each user must wait for their check to be processed. NOTE: The total amount of time a user must wait for their check to complete consists of: the queue time (if any), the time it takes for the server process the document, and the time it takes for the plug-in to mark the document with flags. As well as the performance measurements in the Dashboard, there are also more in-depth profiling tools available that give you more detailed information about your memory usage. You could set up a test server and use a profiling tool to confirm how much memory the server computer needs to check a document. For example, you could use the free JConsole tool that comes with the Oracle Java Development Kit (JDK) or invest in a more powerful Java profiler such as Yourkit . The performance depends on the setup of the server computer. The more hardware resources you allocate to the server, the better the performance. You typically achieve the best performance when you install Acrolinx on a dedicated server with high-end hardware and no other processes running in the background. You can run Acrolinx on a computer with lower-end hardware, but your peformance will not be as good. The following table gives you a good idea of the differences in perfomance between high-end and mid-range hardware. In a more typical setup, you might install Acrolinx on mid-range hardware and with other processes running in the background.